Don’t rush to remove the faucet for cleaning just yet: there may be a way to cleanse it without unscrewing from the tubes. 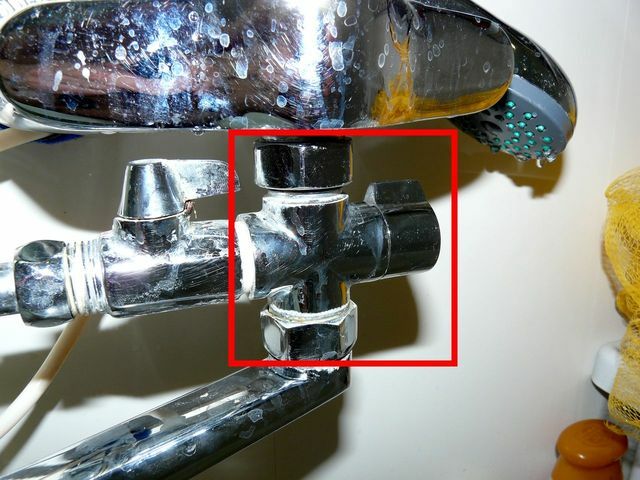 To do that, remove the mesh from the tip of the faucet and screw in a coin of similar diameter to block it. The idea is to let the water pass through the blocked faucet from hot water pipe into the now empty cold water pipe to blow the dirt back into the pipe. Reopen the cold water lifting pipe and repeat the procedure for the hot tube: close the hot water pipe, open the hot water on kitchen faucet and open the bathroom faucet in middle position. If the coin doesn’t block the output well enough, you may push it with your finger or a screwdriver, if the water is too hot. This easy procedure should help you cleanse the faucet fast without having to remove it. However, if you notice that the water passing through the bathroom faucet produces a nice and steady flow in the kitchen, that means the faucet is not clogged. The problem is most probably in the faucet-shower selector, so start cleansing by unscrewing the selector only. Either clean it manually, or just pour in any anti-lime and rust chemical.